This is the introduction to a series of memos presented as part of a workshop organised by the LSE Middle East Centre on 5 October 2018, looking at national identity and the Emirati state. Existing literature on state-sponsored or manufactured identity formation tends to focus on historical examples since most states have already undergone this process. The case of the United Arab Emirates (UAE), however, like some of its Gulf neighbours, is particular insofar as these processes remain ongoing. This blog series aims to bring together scholars and literature from anthropology, sociology and political science to understand the means by which Emirati heritage and identity are constructed in the twenty-first century, taking into account both top-down and grassroots sources of identity construction. We take the case of the UAE as a prime example among the Gulf countries of state promotion of heritage and identity. Nowhere else have efforts to provide a national myth been more broad-based and ambitious than in the UAE, which has worked determinedly to promote a sense of shared identity and values among its citizenry. This is no coincidence: the union of the seven emirates was famously contested and grew out of necessity following the withdrawal of British power; in fact, Ras al-Khaimah agreed to the union several months after its creation and a national armed force was not fully unified until 1996. On 5 October 2018, the LSE Middle East Centre organised a workshop looking at the promotion, (re-)production and articulation of a coherent national identity and heritage in the UAE. In preparing for this workshop, we highlighted the below five core dynamics that help shed light on the country’s unique approach to nation-building and heritage. This series of blog posts will serve as a starting point for further discussions about Emirati heritage and identity formation by highlighting some main topics of discussion that emerged from the workshop. Benefitting from substantial state-accumulated wealth, the Emirati government is able to devote considerable funds to a variety of heritage projects which foster shared identity in a state where citizens compose less than 15 percent of the total population. The UAE houses an impressive variety of federal-level government-linked bodies with authority over heritage preservation, including the Ministry of Culture and Knowledge Development and the National Council of Tourism and Antiquities, not to mention a variety of emirate-level institutions with a similar mandate. A second unique aspect of Emirati heritage and identity is the role of non-citizens, who comprise 80–90 percent of the country’s total population. Within Emirati national identity and heritage construction, the relationship between Emirati national citizens and non-citizen residents appears to be framed in terms of the homogenous former group as ‘owners’ of Emirati heritage and historical narrative, while playing ‘host’ to the latter group who thereby constitute ‘guests’. 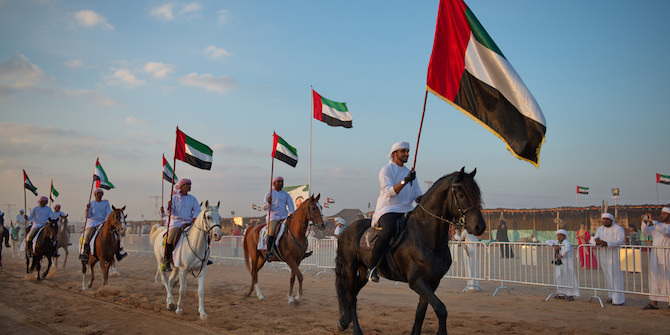 Elite sports, often called ‘heritage sports’ – notably falconry, camel racing, and pearl diving – also play a role in reinforcing the participatory division between citizens and non-citizens in national identity construction in the UAE (and also varyingly across the Gulf region). Interestingly, and despite the undercurrent of exclusivity in state discourse on national identity, over the course of 2016, the UAE began going beyond merely promoting the state’s past to promoting two other values for Emirati culture: happiness and tolerance. Indeed, in March 2016, the state took the unprecedented step of creating a position for the Minister of State for Happiness. In the words of the job holder, Ohood al-Roumi, ‘the main job for the government is to create happiness. In 2011, the UN encouraged the member countries to look at happiness for a holistic approach for development.’ By making residents’ happiness the responsibility of the government, the UAE has thus expanded the purview of the state in everyday life of its citizenry. In 2016, the country also announced plans to release the UAE Charter of Tolerance, Coexistence and Peace, alongside launching a Ministry of State for Tolerance. This more recently institutionalised value of tolerance may in fact reflect a shift in state concerns, whereby adherence to international norms is prioritised, all the while traditional Bedouin values that shape Emirati identity continue to be diligently promoted. The citizen/non-citizen dichotomy in the UAE also notably dovetails with tensions between the national and the international at the heart of Emirati nationalism and the government’s drive to present the country as modern, cosmopolitan and tolerant. The imposition of the concept of ‘nation-state’ in the Gulf during the latter 20th century (as also occurred across the wider region) represented a sharp and largely artificial departure from the peninsula’s historically tribal socio-political structures. In this way, nation-building has not relegated but rather has maintained – perhaps even heightened – the salience of the tribal. This tension between the state’s pursuit of the construction of a coherent identity at the national level, versus the reality of sub-national identities, is reflected across the region. In this context, the role of heritage and nation-building initiatives can be seen to reflect and institutionalise, rather than re-dress and overcome, the existing and contested distributions of power in society. Heritage projects in the UAE embody a particular emphasis on ‘Arabian Bedouin desert traditions’ and a ‘Bedouin-style cultural past’, despite the fact that the majority of the country’s nationals belong to settled (and largely urban) communities. Inter-emirate rivalries raise the question of the extent to which there exists – in actuality or potentiality – a singular, coherent ‘Emirati’ identity. The UAE’s emphasis within its heritage initiatives upon a Bedouin culture that may have little relevance to many Emirati nationals arguably has the effect of underscoring ‘the separate identity and history of the individual emirates, for whom the notion of the wider Emirati nation is a construct with, by definition, a short-lived history.’ Thus the individual emirates have varyingly sought to inculcate their own sense of a unique identity. Sharjah, for example, has been developing a ‘historic centre’ to establish its own identity, attract tourism and differentiate itself from neighbouring emirates. The competition for prestige between Dubai and Abu Dhabi and, increasingly, Sharjah appears as both integral to, and somewhat a threat to, the wider Emirati nation-building project. The histories of these different emirates help explain why and how they have evolved differently in terms of political and social structures and tendencies, which are carefully documented in individual emirate museums and heritage sites. See Roger Brubaker, Citizenship and Nationhood in France and Germany (Harvard: Harvard University Press, 1998); Mihailo Crnobrnja, The Yugoslav Drama (London: I.B. Tauris, 1996); Hugh Trevor-Roper, “The Invention of Tradition: The Highland Tradition of Scotland,” in The Invention of Tradition, eds. Eric Hobsbawm and Terence Ranger (Cambridge: Cambridge University Press, 1983); Michael Ignatieff, Blood and Belonging: Journeys into the New Nationalism (Farrar, Straus and Giroux: New York, 1993); David Latin, “National Identities in the European State,” in Minority Nationalism and the Changing International Order, eds. Keating and McGarry (Oxford: Oxford University Press, 2001).